Pro-EU political parties must rally support ahead of crucial European Parliament elections in May, the Hungarian-American businessman and controversial influencer wrote in an op-ed published by Project Syndicate. The outspoken opponent of Brexit suggested that it wasn’t too late for the UK to hold another referendum, “or, even better, for revoking Britain’s Article 50 notification” – advocacy which appears to clash with Soros’ self-declared affinity for democracy. In the UK, the billionaire has been sharply criticized for forking over £800,000 (US$1,062,000) to pro-EU campaigns, including £400,000 to Best for Britain, a campaign group that has been at the forefront of anti-Brexit activism. On the topic of Italy, Soros chided the EU for “strictly enforcing” an agreement “which unfairly burdens countries like Italy where migrants first enter the EU.” As a result, the massive influx of migrants into Europe has transformed the once pro-EU Italy into a bastion of populism, Soros lamented. Curiously, he failed to mention that he is a leading champion of the EU’s open-door migrant policy – a policy which is directly responsible for Italy being swamped with asylum seekers. Soros has been repeatedly accused by Orban of using his wealth to push pro-migrant policies on conservative, anti-immigration Hungary and much of the Western world. Hungary has even passed a Stop Soros Law, aimed at punishing those who provide assistance to migrants trying to illegally enter the central European country. 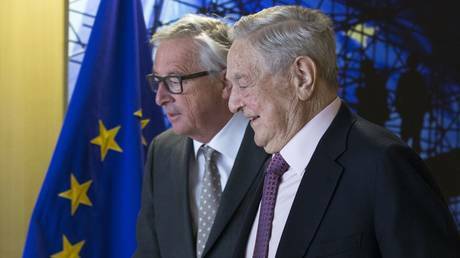 If Europe’s political leaders fail to stamp out the rise of populist political parties within the bloc, “the dream of a united Europe could become the nightmare of the 21st century,” Soros wrote in closing. Sadly, Soros doesn’t elaborate on why he believes the democratic will of Europeans poses such a fearsome threat to his grand vision for a “united” Europe.